What are the first few books that every person attempting to "learn" these areas of philosophy at an undergraduate level read? Philosophy of language and philosophy of mind are sometimes done in ways that mirror the philosophy of the hard sciences [e.g. cognitive science] and sometimes not. Apparently there is a philosophy of logic and philosophical logic which do differ. Philosophy of logic is the arena of philosophy devoted to examining the scope and nature of logic. Philosophical logic is the branch of logic concerning aspects other than or outside of formal logic. Philosophy of Computer Science - is concerned with philosophical issues that arise from reflection upon the nature and practice of the academic discipline of computer science. Philosophy of science - is concerned with the assumptions, foundations, methods and implications of science. The external world: realism, am I dreaming etc. I don't think that there is a single useful non-overlapping set of branches. For instance, philosophy of mathematics and philosophy of logic are, on some views, contained within one another (on some views philosophy of logic is a branch of philosophy of mathematics, on others the containment goes the other way). Both take up issues that are also clearly within Epistemology and Metaphysics. This list has a good deal of overlap, too. Metaethics arguably straddles all of the first 3; philosophy of mind overlaps with at least metaphysics, etc. Philosophy of language seems an odd man out, but given its importance in analytic philosophy and that it cannot be comfortably subsumed under any other branch on my list, I'm stuck with the oddity. The following chart (that I edited for amelioration) depicts, includes, and better organises many more subfields of philosophy than all of the other answers in this thread. 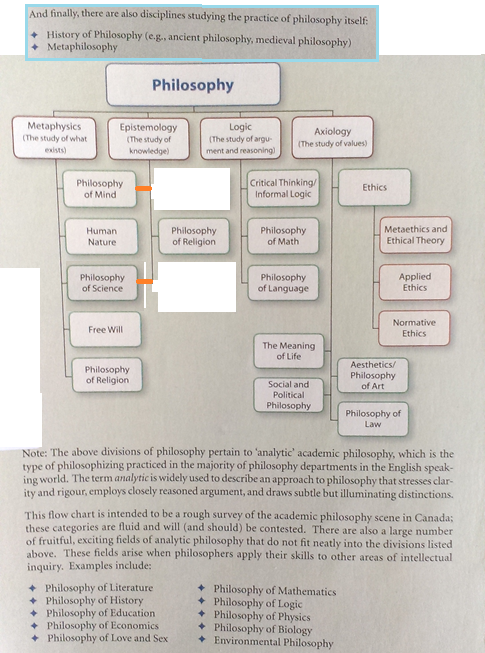 Source: Inside of the Back Cover, Introducing Philosophy for Canadians: A Text with Integrated Readings (2011 1 ed).